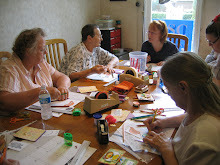 Cootie Coo Creations: Christmas in July -- don't miss the fun! Mark your calendars! Christmas in July is coming to Cootie Coo Creations! On Monday, July 25, there will be TWO card making sessions (9:00am - 1:00pm and 2:00pm - 6:00pm) during which participants can make EIGHT Christmas cards in a session. The cost is $25 per session and participants may opt to take either the morning or afternoon class (cost of $25.00) or BOTH classes (cost of $50.00). There will be 20 different cards to choose from, so there will plenty to do if anyone is game for spending the entire day at The Coo. For an additional $5.00, participants can sign up for the pizza party (from 1:00pm - 2:00pm), with yummy pizza from Pepperonis and beverages - whoop whoop! Of course, what is "Christmas in July" without prizes and giveaways, so it is sure to be fun for all! Registration is now open for "Christmas in July at The Coo", but remember that your "spot" is not guaranteed until your registration fee has been paid. Ho ho ho, good times never cease at The Coo!